Our product range includes a wide range of hdpe color rolls. 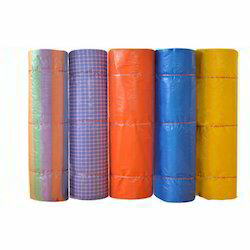 Our clients can avail from us HDPE Tarpaulin Rollsthat are just similar to LDPE, but have higher tensile strength, higher impact and puncture resistance. These rolls are manufactured using high grade lower thickness films that can be blown than LDPE and have with better environmental stress cracking resistance. As compare to LDPE, these films are difficult to process and have lower gloss as well as narrower range for heat sealing.